Entries are now being accepted for the next phase of the International Forklift & Interlogistics Awards (IFOY) programme for 2019. Intralogistics providers can enter their new vehicles and solutions up to 30 October, 2018. The eleven categories in the ever expanding global competition covers material handling products and solutions for almost every application. In addition to forklifts, warehouse equipment and special build vehicles, automated guided vehicles (AGVs), shuttles, robots, software and apps or successfully implemented integrated warehouse concepts are approved for application. In addition, outstanding technical details or components, such as ergonomic innovations, safety solutions or automation components are awarded for their achievements. 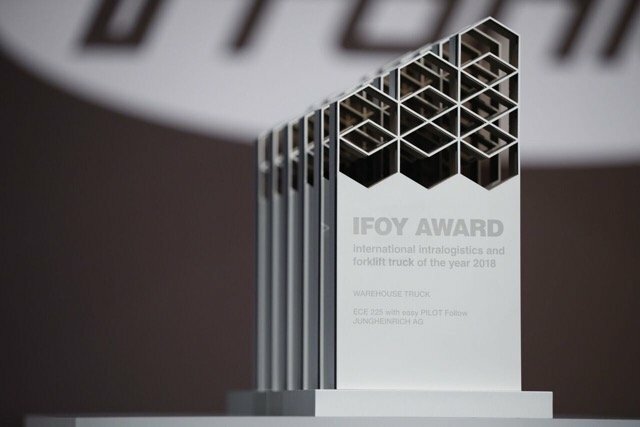 For the first time, startups also have a permanent place at the IFOY Awards. In a separate category, they can submit their developments in intralogistics. International Intralogistics and Forklift Truck of the Year Executive Chairperson of the Jury. The conditions of participation can be requested from the IFOY office (www.ifoy.org). Heavy Load Forklift and Special Vehicle: forklifts and vehicles for special tasks: container stackers, transportable forklifts, heavy-load forklifts from 8 tonnes, special vehicle manufacturing. Warehouse Truck “highlifter”: materials handling equipment from the 2nd shelving level, such as high-bay trucks, VNA trucks or reach trucks, pedestrian-controlled highlift trucks, order-picking trucks, etc. Warehouse Truck “lowlifter”: materials handling equipment up to the 1st shelving level, such as pedestrian-controlled lowlift trucks, lift trucks, tow tractors, tugger trains, order-picking trucks, etc. Intralogistics Robot: robots or robot-based solutions for intralogistic applications, such as picking robots, palletizing and depalletizing robots, cobots, robots for automatic unloading and loading of trucks, etc. Intralogistics Software: apps and intralogistics system or software solutions in the context of the application options, such as warehouse management systems, truck guidance systems, advanced driver assistance systems, fleet management systems, etc. Integrated Warehouse Solution: a warehouse concept that has been successfully implemented at the customer’s location. Special of the Year: components or technical details that significantly improve economics or environment, or the physical or psychological conditions of the user, such as ergonomic innovations, safety assistant solutions, automation solutions, drive technology, forklift attachments, etc. NEW Startup: the prize is awarded to innovative prototypes or functional developments (intralogistics products, software, vehicles or components) of newly founded companies.